Toads are among the least attractive of our garden friends. They have been unpopular since the day a sassy princess was ordered to pucker up and kiss one on the thin green lips. 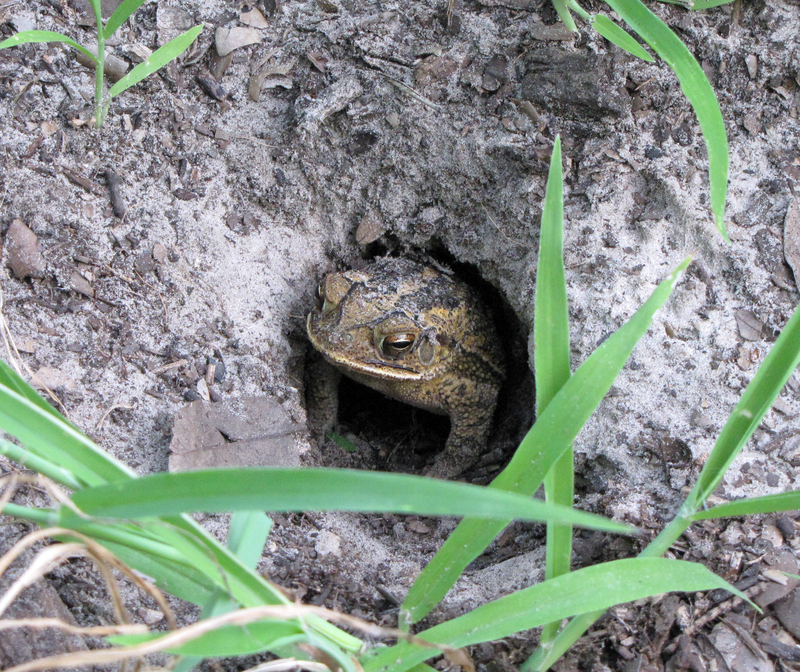 But don’t let their frowning faces fool you–toads are a powerful ally in the garden. A toad can eat up to a thousand insects in a single night: caterpillars, slugs, beetles, ants, mosquitos, and flies. Toads capture these insects by snatching them with their long sticky tongues, and even using their front feet to shove larger bugs into their mouths. Toads eat with their mouths, but toads drink water through their skin. This process, called cutaneous absorption, is why you see toads sitting in pools of water, but never see them drink. Toads have pockets of glandular toxins on their skin that look like warts. These toxins are a self-defense mechanism against predators, and can even be fatal to coyotes, foxes, and raccoons. This poison is the reason the witches in Shakespeare’s play first threw a toad into the cauldron to cast their wicked spell. Because of this amazing skin, toads are tough and extremely resilient. But there is one thing that will absolutely kill a toad: chemical pesticides. Because of cutaneous absorption, toads are forced to drink chemicals through every pore of their skin, and it is fatal. 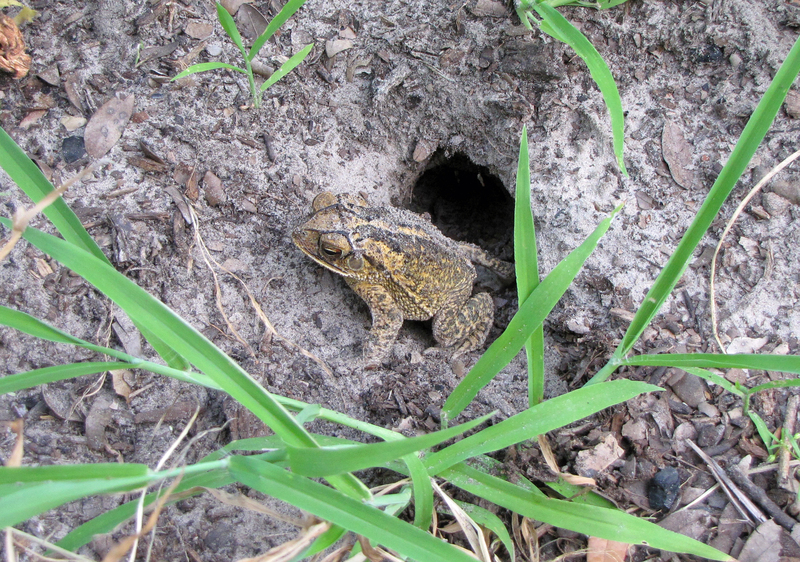 When toads are killed, it takes a long time, sometimes years, for them to repopulate and help in the garden. Unfortunately, the insects that toads would have eaten reproduce in a matter of weeks, or even days, and grow out of control. That is one the reasons pest problems tend to return after a spray of chemicals, and even worse than before. To attract toads to your garden, plant your vegetables intensively so the leaves grow together and form a thick canopy over the soil. This canopy provides cover and protection for toads and other beneficial predators. A dense planting of flowers nearby also provides an excellent sanctuary, even when the vegetable garden is bare. Also, place a few shallow pans of water in your garden, flush with the level of the soil, so toads can easily climb in and out to drink. On our farm, we place these pans beneath our drip irrigation lines, down the center of each row, so the pans are refilled every time we water the garden, and the toads are drawn to our vegetable crops. Protecting your toads is simply a matter of economics: A single South Texas toad can eat more than 30,000 bugs during the summer. A few toads in your vegetable garden will eradicate hundreds of thousands of insect pests that you will not have to treat. Toads save a lot of money, labor, and produce. It is true, toads are not particularly attractive. But you will rarely even see them; and unless you are a hopeful princess, you will certainly never have to kiss one. Toads do their work in the dark of night; hunting beneath their canopy of leaves and flowers; drinking water through their skin; and busily eliminating pests from your garden. Toad Going out at Dusk to Hunt. Toads Eat up to 1,000 Bugs Every Night! 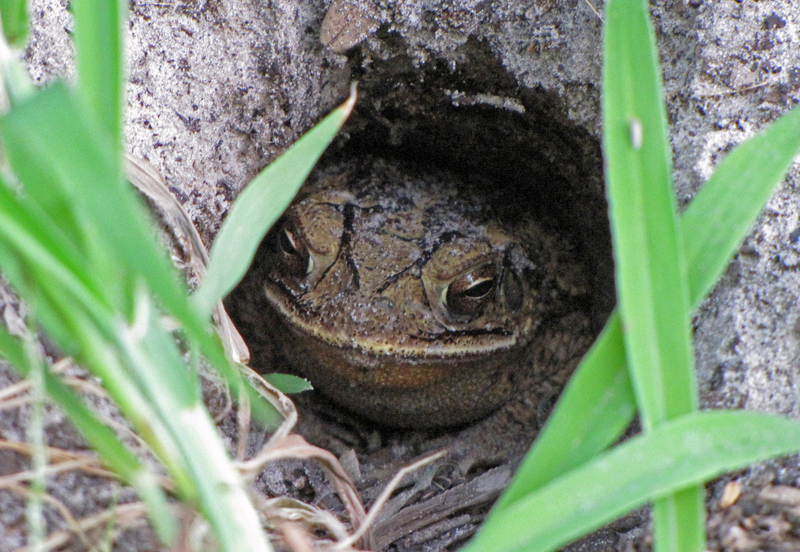 Wonderful post on one of our gardens helpers, I love the fact that we have many, many toads and frogs on our farm, each year it seems we have more and more, all a sign that our land is thriving. Because of the very wet spring, we have more babies then I have ever seen before in our neck of the woods, at a certain point, you could not walk in certain spots without having little tiny hopping baby jumping to get out of the way.. I hope more folks provide for space in their gardens and yards for this very wonderful eater of all kinds of bugs! Yes! I love your pictures and your updates! In our neck of the woods, it is extremely hot and dry, and on top of that, we have been in an historic drought for five years. Still, we have more toads in our gardens every year. Toads can tolerate drier conditions than frogs, and can go longer without water, so we see a lot more toads than frogs. I would love to get a count of our toads in the garden, and try to calculate how many millions of insect pests they eradicate each year without us having to spend money or time to do the same work (and probably not as well). In fact, I wonder if there is any chemical pesticide that works as well in the long run. Thanks for your wonderful insights into farm life! Yes he is ,and I still enjoy reading his works . Thank you so much Mom. I am YOUR #1 fan.